Molly Groome (left) and Jake Robinson are troubled siblings in The Plot. Top: Harold Surratt (left) as Victor and Deandre Sevon as his son, Tyrone, in Ibis, part of Summer Shorts 2018. Twenty-five hundred years ago, Aeschylus introduced the plot-twisting device which came to be known as deus ex machina. A drama was resolved by the sudden appearance of a god who literally swooped in on a crane. But it took Steve Jobs to provide the technology for what might be called familiaris ex machina. A character can now change the direction of a play by dialing up a family member, even if that person is outdoors, while features like caller ID and virtual assistants can provide protagonists with previously unattainable instant knowledge. So, in Claire Zajdel’s hard-to-fathom piece, The Plot, an unlikable brother and sister indulge the playwright’s overreliance on the iPhone to create an even more unlikable and unseen third character: their constantly calling mother. In Eric Lane’s ambitious Ibis, a father hangs up on the son he abandoned, but when he reconsiders that hasty decision, he of course has the boy’s number in the phone log, allowing the play to pivot. 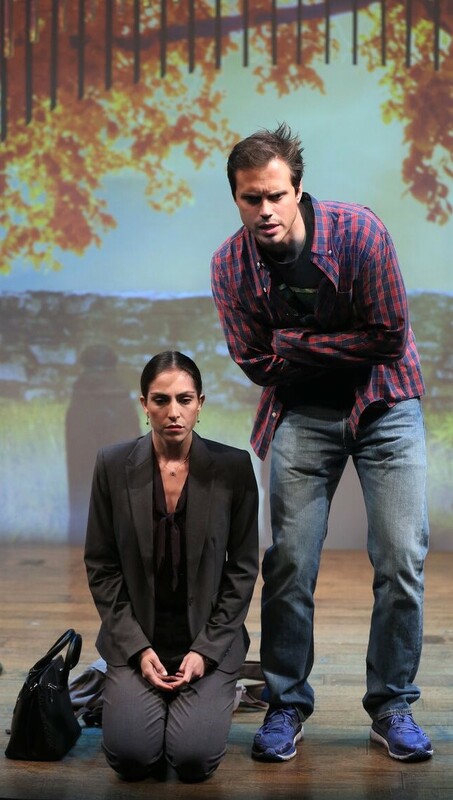 And, in Neil LaBute’s flirty Sparring Partner, a husband gets a lunch-hour call from his wife that seals his fate. As its title hints, The Plot takes place in a cemetery. A harried lawyer named Frankie (Molly Groome) and her immature younger brother, Tyler (Jake Robinson), have been summoned there by their mother to inspect the grave she has purchased for herself as well as to have their life decisions judged by each other amid guilt trips and bouts of insecurity. Frequent calls to and from a mom who wants her kids next to her in death, even if she can’t be bothered to show up for this particular appointment, prove more annoying than revelatory. Groome and Robinson are full of neurotic angst but offer no sense of family cohesion, and director James Rees has little idea of where to steer his actors on the nearly empty stage, nor the wherewithal to instruct Groome not to bang her shoe so loudly on the stage floor when her character is unrealistically using it to try and dig up a headstone from the soft soil. Ibis begins as a mystery in the style of film noir and ends like a Hemingway short story. A female detective, who may or may not be named Sam Spade (Lindsey Broad), meets with her latest client, Tyrone (Deandre Sevon), a young African American who has hired Sam to locate his long-lost father, Victor (Harold Surratt). Amid tinkling piano music and atmospheric blue lighting that casts slotted shadows on the wall, Tyrone, who has a passion for numerology, gets the 411 on his pops. With cleverly constructed dialog that feels mathematical even as it name-checks Barbara Stanwyck and Mary Astor, we learn that Victor got lucky with some numbers of his own and opted to start a new life with his windfall. A couple (KeiLyn Durrel Jones, left, and Joanna Christie) take a long lunch in Sparring Partner. Photographs by Carol Rosegg. Broad turns in a charismatic performance, and we miss her as the story progresses from a whodunit to a why’d-he-do-it. Fortunately, Surratt and Sevon are more than capable of carrying on. They come to terms with each other on a park bench, displaying a nicely keyed sentimentality as Victor recounts the abandonment issues with his own father, tying them to a memory of what a happy family looks like, together on vacation, watching a flock of white ibis against the sunset. It’s a poetic closing monologue that is a million miles away from the enigmatic atmosphere of the play’s opening scene. Sparring Partner marks the quiet return of Neil LaBute, following his unexplained February dismissal as playwright-in-residence at the MCC Theater. Here, a man (KeiLyn Durrel Jones) and a woman (Joanna Christie) while away a lunch hour on a park bench, testing each other’s knowledge of movie trivia. As their game progresses, the power dynamic between the two is revealed. Though he is her boss, and a married one at that, they have clearly spent many happy lunch hours together and their relationship is teetering right on the line of impropriety. But this is not a treatise on infidelity; it’s a warning about waiting to follow one’s heart, as the woman comes to slowly realize that she has provided “just enough” of an escape to keep the man from ever leaving his less-than-perfect marriage. So, when the suspicious wife suddenly calls, his ringtone, “On the Wings of Love,” is more than enough to make the woman finally see that it is time to disconnect. The chemistry between Jones and Christie is perfectly tempered and director J.J. Kandel (the founder of Summer Shorts) brings sharp focus to LaBute’s view of the stakes and mistakes of playing a game too long. Summer Shorts, Series B, plays through Sept. 1 at 59E59 Theaters (59 E. 59th St.) Evening performances are at 7:15 p.m. Tuesday through Sunday; matinees are Saturday and Sunday at 2:15 p.m. For tickets, call Ticket Central at (212) 279-4200 or go online to 59e59.org.